Torrie Decker Bartalone | Is Bowling Your Career Choice? Head Coach of Lourdes University Gray Wolves bowling for men and women. She was charged with creating the program from scratch in its inaugural season of 2018-2019. Former assistant bowling coach at Robert Morris University (Illinois) in 2017-2018. She also spent three seasons as an assistant bowling coach at Calumet College of Saint Joseph. 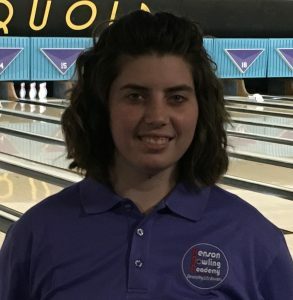 Torrie began her college bowling career at Robert Morris University (Illinois) where she earned her Associates of Health Sciences degree as a fitness and exercise major. She continued her collegiate career at Valparaiso University where she graduated with a Bachelor of Arts degree in psychology. While there she earned Honorable Mention All-America honors from the National Tenpin Coaches Association in 2014-2105. Coach Bartalone currently resides in Toledo, OH with her husband Dan who is her assistant coach with the Gray Wolves. They have one son.